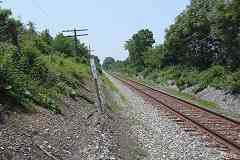 Straight track over dry, level land: great for trains, boring for railfans. Fortunately more interesting stuff lies ahead. 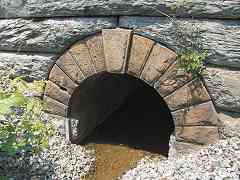 When does a bridge become a culvert, and a culvert become a bridge? 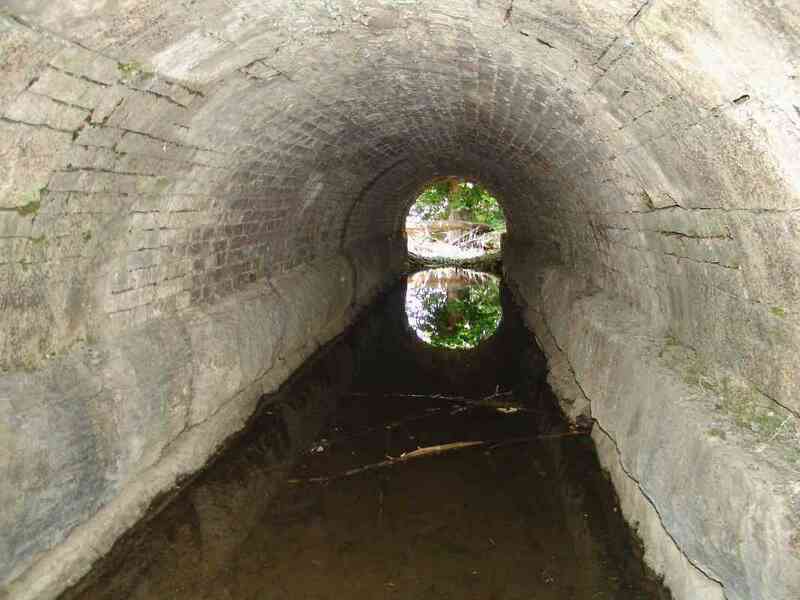 I don't believe there is an "official" definition, but the one I've been using at this site is culverts are ones small enough to not need an arch. Well, this example near Adamstown blurs that distinction: it's small, but it still uses an arch. The key may lie in the stone. 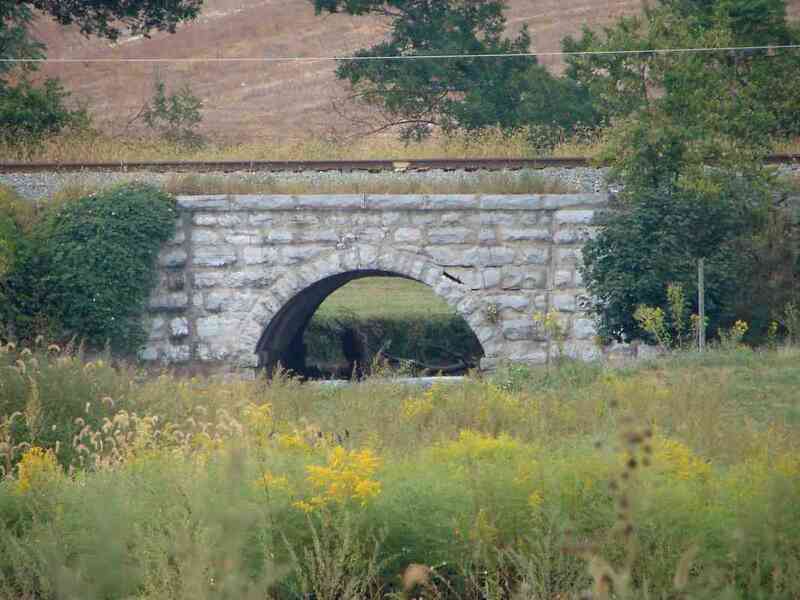 OML culverts east of Frederick Junction employ granite, but the stone blocks here appear to be limestone, readily found in this area. Limestone has only one third to one half the "modulus of rupture" of granite, which means it breaks under less pressure than does granite. A slab of limestone may not be strong enough to span the gap, so instead here an arch was employed to spread the load more evenly. 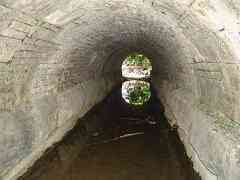 The interior of the bridge/culvert is lined with brick. In this view it appears larger than it is. New houses for railfans are going up at milepost 61. 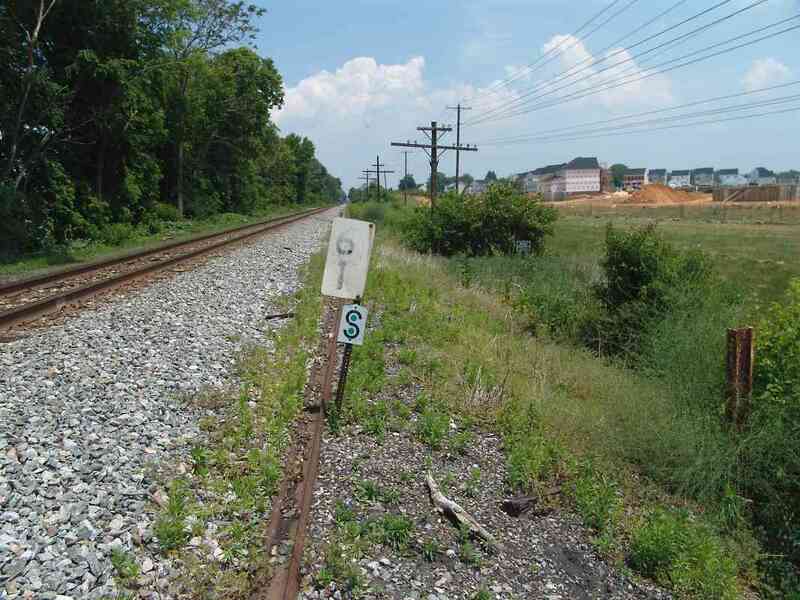 The S marker indicates the start of a "measured mile" that train crews can reference to check their speedometers. 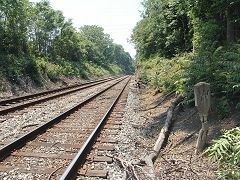 An old "mile marker on a rail" can be seen at the right. The concept of a "measured mile" has always struck me as odd. What about the other miles? Were they simply guesstimated? Does "measured mile" mean it was measured more precisely? 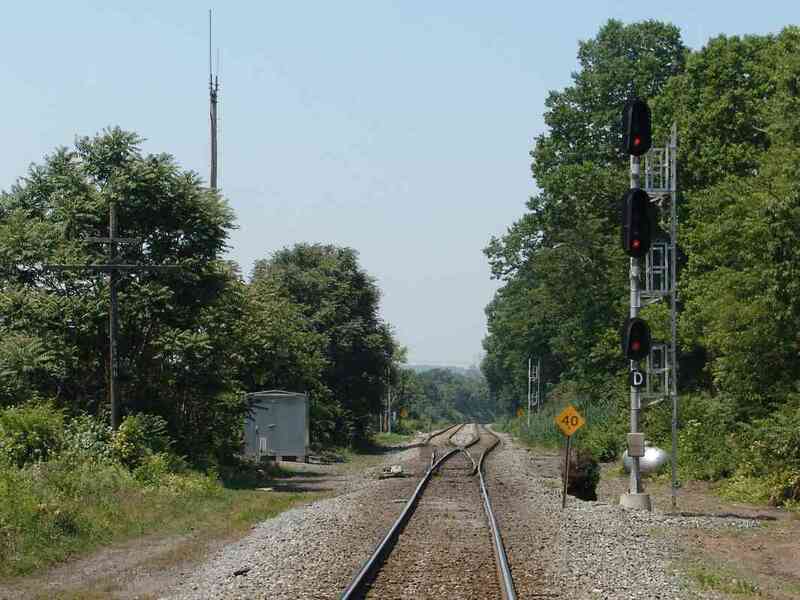 If the purpose is to calibrate onboard equipment as a train speeds by, the errors introduced via that visual process, as well as variance in the diameter of the locomotive's wheels due to wear, will overwhelm the accuracy of the "measured mile". Yes, the track between mileposts 60 and 61 is straight, but these measured miles also appear elsewhere along non-straight runs. "Most measured miles were placed where a constant speed could be maintained, either level, uphill or down, but a constant grade. Around here we had them where there are no speed restrictions within miles. Probably so we wouldn't have to be in the process of slowing down or speeding up while checking the speedo. It's an old time thing, I'd heard from old heads that some steam engines before their time didn't have speedo." OML stone arch bridges are not as common west of Frederick. This one, dating to 1832 and spanning Tuscarora Creek, appears to be in danger of losing an arch stone despite recent concrete patching. A short distance upstream (right) of this location marks the eastern junction of the OML and the Adamstown Cutoff. 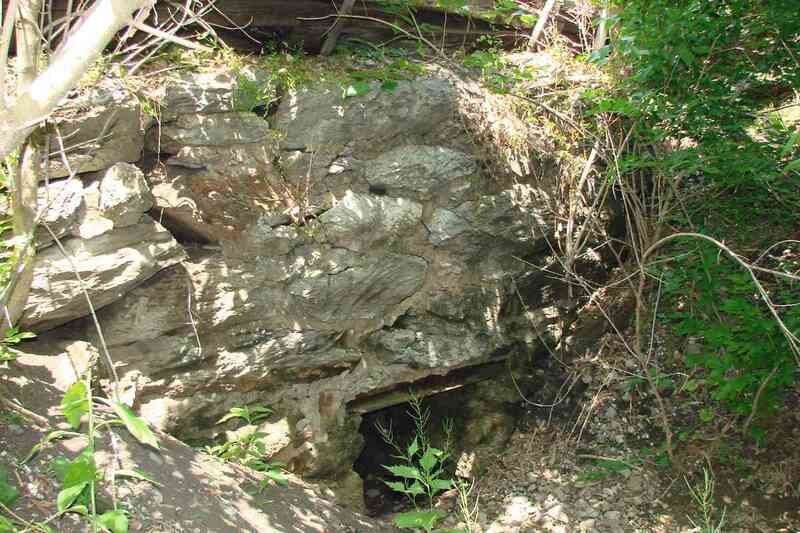 The Adamstown Cutoff was a Loree project completed in 1902 that provided a longer, but less steep route east from Point of Rocks. The theory was that heavy eastbound coal trains could negotiate the Cutoff's more gradual incline without the need for helper engines. It worked most of the time, however, frequently enough and particularly in wet weather, a locomotive would start to slip and then become stranded at the sharpest curve along the Cutoff. The area at the Doubs Road grade crossing was once part of "Carrollton Manor" owned by Charles Carroll, the person to whom the B&O gave the honor of turning the first spade of soil for the fledging railroad on July 4, 1828. 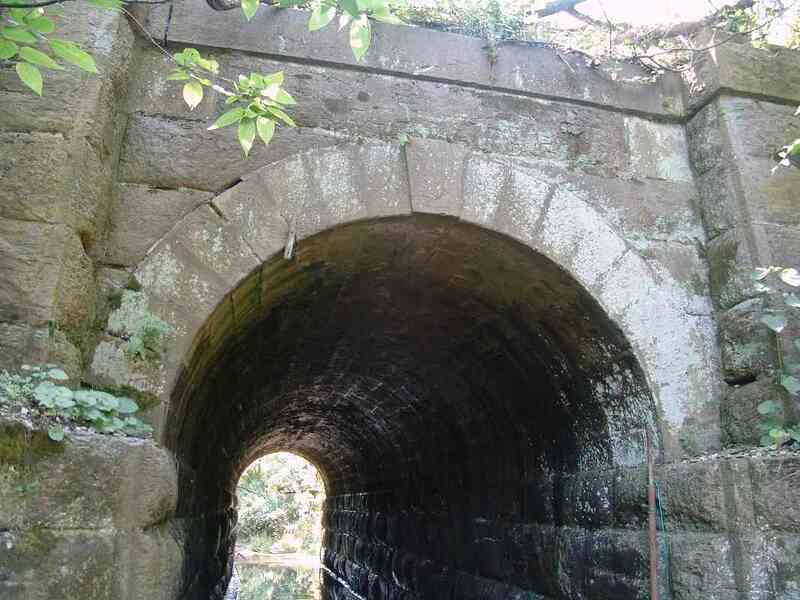 In 1832 the railroad paid him over $3300, a record at the time, for the right to build through the manor. A nearby historical marker reads: "Carroll's Mill - Stone structure nearby was flour mill built in 1812 by Charles Carroll of Carrollton (1737-1832), wealthy landowner and signer of the Declaration of Independence. Site was within his 17,000-acre wilderness tract called 'Carrollton Manor'. He deeded the mill to Sarah Ann Hoffman in 1821, and subsequent owners were named Doub, Copeland and Smith." The OML is double tracked from here west to Point of Rocks. 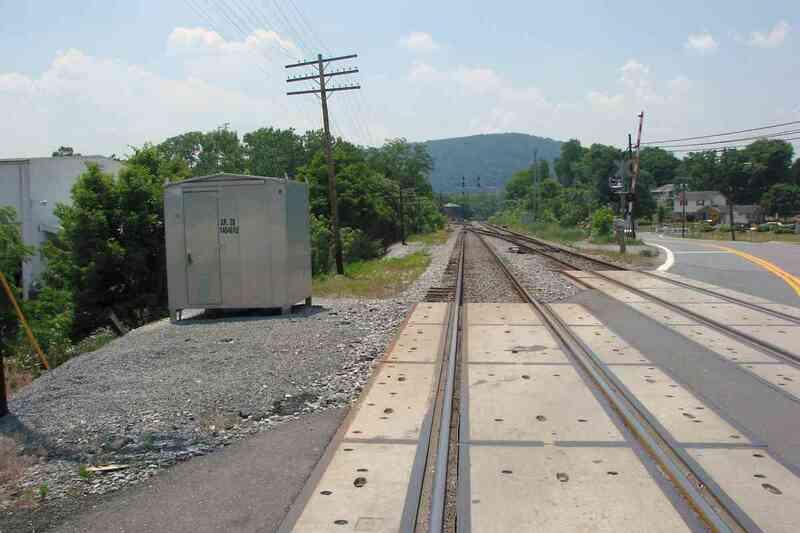 What CSX calls Track 3 is on the right, and Track 4 on the left. With plenty of room to walk underneath, this stone arch bridge over a Tuscarora Creek tributary is the OML's most substantial of this design since the one spanning Bush Creek almost 20 miles east. It displays a (re)construction date of 1871, a rather "unusual" year since there is no record of a flood at that time that may have destroyed the original bridge here. A private crossing around the bend necessitates a whistle signpost now on its last legs. I was unable to find the origin of the name "Calico" for this cut. Anyone know it? "There's a red sandstone conglomerate that is very abundant in the Point of Rocks area. Geologists have nicknamed it 'Potomac Marble' and 'Calico Rock'. It has a dark red base embedded with smooth multi-colored stones. When polished, it is very beautiful. "In fact, there are several tombstones in the St. Paul's church cemetery on Ballenger Creek Pike near Route 464 made of polished 'Calico'. You should check them out - you'll be impressed. There's also campground on the C&O Canal nearby named 'Calico Rocks'. 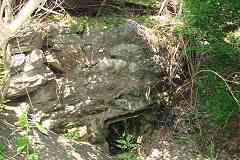 The Point of Rocks area is very well known for this unique stone." "Another interesting fact... the columns of Statutory Hall in the Capitol building (DC) are cut from this same limestone breccia, quarried from the area. They are 3 feet in diameter and 20 feet tall." The OML's most sloppily-constructed culvert hides here so that the tracks can cross the sloppily-charted stream improperly named "gton Run" on ADC maps. No fewer than four more culverts (of better construction) can be found within the next 1.5 miles west. 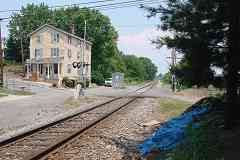 The OML emerges from rural territory at Point of Rocks, but first it must cross MD 28. If you want to turn your train around on the Old Main, the wye at Point of Rocks is one of only two places outside of Baltimore you can do it. 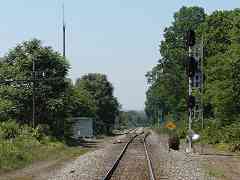 The east leg of the wye seen at left leads to CSX's Metropolitan Subdivision. In 1875 the B&O completed the dramatic, Baldwin-designed Point of Rocks Station. Here the then new Metropolitan Branch (right) and OML (left) meet, and MARC commuter service means passengers still put the site to its intended use. 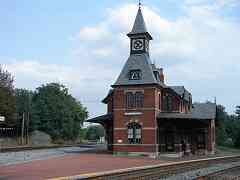 Most of the station had to be rebuilt in 1931 after lightning struck and severely damaged the original. In person and up close, you can observe the obviously different ages of various sections of brick. The building is on the National Register of Historic Places. By 1832, the B&O had built some 65 miles of track from Baltimore to here at Point of Rocks. 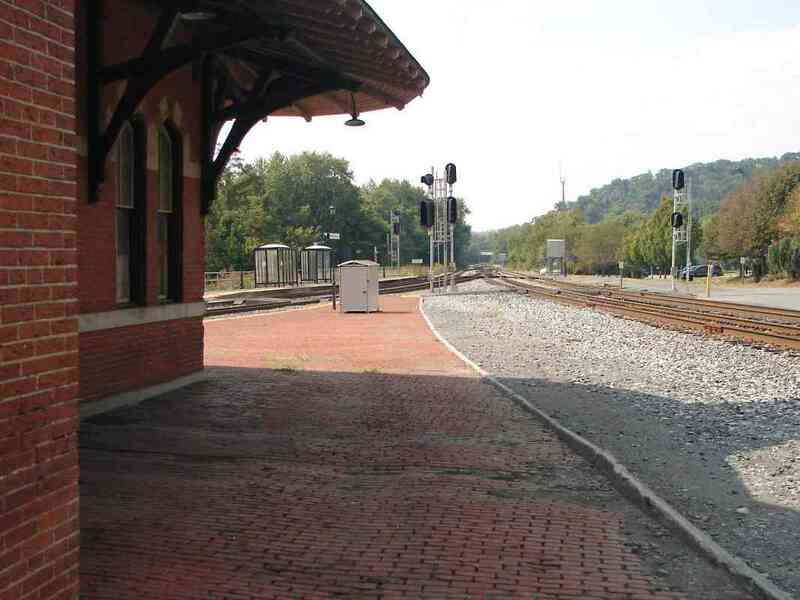 That's an impressive rate of more than 15 miles of track per year at a time when virtually all the work was done by hand, and much of it redone after the initial track designs proved unacceptable. Double tracking would wait until the 1850s. 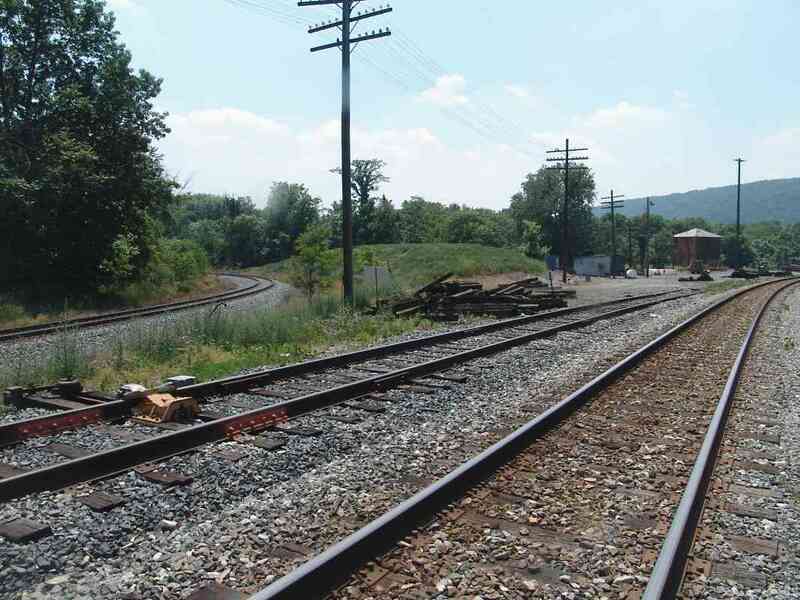 As the tangle of tracks in the distance will attest, this remains a busy and important spot for the railroad. Trains bound for Washington, DC split from the main and curve off to follow the Potomac River down the Metropolitan Branch on the left. Those bound for Baltimore head right and behind. 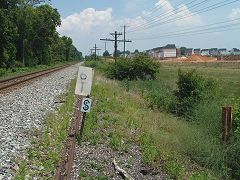 CSX's Old Main Line Subdivision ends here at Point of Rocks, however the B&O's original Main Line continued west, and is now part of CSX's Metropolitan Subdivision. The Old Main Line ends here!